Trading cryptocurrencies involves understanding multiple exchanges, arbitrage, ICOs, forks, airdrops, and more. If you want to succeed as a crypto trader, you have to know how to manage constant information overflow. While there is no limit to how much capital can be invested, there is a limit to how much time a human can reasonably spend researching and trading each day. Many trading programs try to solve this limitation by automating the entire trading process. However, these programs often produce inferior results to what a human trader can achieve. The ideal solution is to use highly intelligent algorithms to provide human traders with the necessary information to make the most appropriate trading decision at any given time. Intelligent Trading Foundation (ITF) has developed a platform that accomplishes just that. 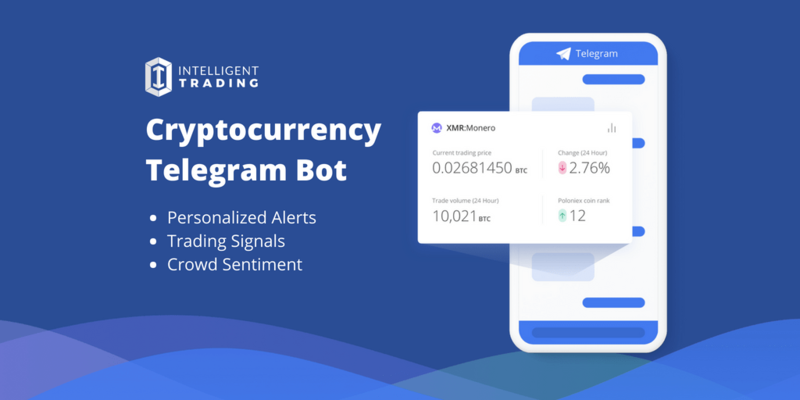 The two Intelligent Trading Bots for Telegram isolate important trading signals from all the noise, then send easy-to-understand alerts notifying traders of potential opportunities in the market. The primary Telegram Bot sends users a variety of trading signals and strategies incorporating popular technical analysis signals such as: Simple Moving Average (SMA), Relative Strength Index (RSI) and Ichimoku Cloud Breakout for hundreds of cryptocurrencies. Together with crowd sentiment alerts from CryptoPanic, this bot does all of the grunt work to provide valuable insight to traders so they can make better trades. Free and premium subscriptions are available. The Intelligent Trading InfoBot displays brief on-demand information about a specific cryptocurrency to members of a Telegram Group that has it enabled. Data displayed includes current coin price, trading volume, and the latest trading alerts. With a simple command, data can be pulled for 269 coins, 442 trading pairs, and three exchanges. This bot is free and can be added to any Telegram Group. Later this year, additional trading alerts and strategies will be released. In Q3, expect to see functionality added for more strategies, arbitrage alerts, weekly key support levels, and A.I. signals. Personal A.I. trading and portfolio management will be introduced in Q4. Intelligent Trading Foundation is developing an artificial intelligence-powered trading assistant for the cryptocurrency markets. ITF’s platform pairs traditional market trading concepts with today’s cutting-edge pattern recognition and machine learning capabilities. These technologies allow the software to continuously scan, analyze, and interpret the massive amount of information available, delivering game-changing trading ideas for traders to execute.